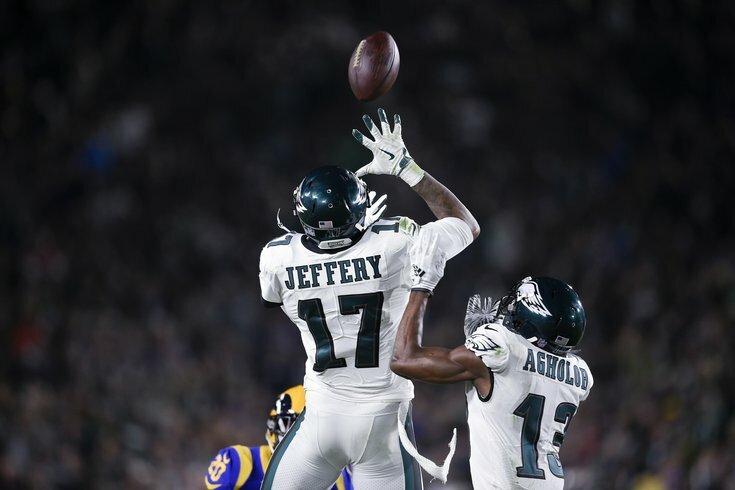 Philadelphia Eagles wide receiver Alshon Jeffery (17) goes up for a pass during the second half against the Los Angeles Rams at Los Angeles Memorial Coliseum. It took until the final seconds and the very last play of the game to get it done, but the Eagles leave Los Angeles with a monster win over the Rams. Behind a dominant performance from Alshon Jeffery and Nick Foles, a heroic effort from the defense, and contributions up and down the roster, the Eagles kept their playoff hopes alive with a 30-23 win. Here's what I saw in Sunday's game. • Philadelphia's first drive in the second half was brutal, but the punt that followed from Cameron Johnston was not. He hit the stuffing out of that thing. • Cre'Von LeBlanc has a name that is very fun to say. But more importantly, he has stepped up big time in a secondary full of cast-offs and new blood, offering some steel in the secondary they've badly needed. With the Rams pinned against their own goal line early in the second half, LeBlanc came close to making a game-changing play, with his hit on Robert Woods being ruled an incompletion rather than a catch and a fumble. His fight was representative of the unit as a whole, continuing a theme from last week's game in Dallas. The Eagles were on the field for almost 100 plays on defense in an overtime battle with Dallas, and while they eventually wilted, that unit scratched and clawed and fought until the bitter end, with the game-winning touchdown coming on an unfortunate tipped pass. This group knows it is outgunned and undermanned, and they just keep coming. And for all the grief Jim Schwartz has taken this season, often with merit, he and this group deserve a ton of respect for how they've performed with their backs against the wall. Schwartz called some well-timed blitzes, and his group far outperformed expectations again on Sunday. • To underscore the point here — Jared Goff shot himself in the foot on this play in the third quarter. But the Eagles still had to be there to take advantage, and they swarmed on his error. • I don't have any idea how both of Alshon Jeffery and Nelson Agholor got open downfield on the same play. I don't have any idea how Nick Foles delivered this ball under duress, as he took a major shot while uncorking the throw. But it was a major play for the offense, and the sort of thing they've lacked all season long. The connection between Jeffery and Foles was the story of the game on Sunday, with the No. 1 wideout picking up right where he left off with Foles during last year's Super Bowl run. Foles gave him chances to win one-on-one battles, but he also seemed to have a good sense of where Jeffery would be and when. I'm not going to play armchair quarterback here and question Carson Wentz's decisionmaking during his starts, because the connection with Zach Ertz has been one of the stories of the season. But it sure feels like Jeffery has more to offer than he has been able to show this season after watching Sunday's game. In any case, major kudos to Foles for a performance that even his biggest supporters were probably unprepared for. This offense has been dormant for most of the year, and Foles helped them put together everything they'd been missing. That's not easy to do, regardless of his familiarity with the offense, and he deserves all the respect he'll get heading into next week's matchup with Houston. • Wendell Smallwood was basically out of the gameplan for a few weeks there, but he made the most of his opportunities against the Rams. His burst to the edges did damage to a Rams team that has struggled to defend the run this year, and when given opportunities in the red zone, he gashed L.A. right up the gut for a pair of touchdowns. Good thing I definitely didn't write that it was confusing to see him get the ball on their first carry of the game. What a mistake that would have been. • There have been a bunch of blown opportunities for the Eagles this year that make you wonder what this season could or should have been. But at the end of the day, this group showed up with their season on the line and got it done with their backup quarterback. It would have been easy to pack it in, but they laid it all on the line. That's a reflection of the group, and certainly the coaching staff. Great effort, if a little more dramatic than it should have been. • Talk about a hell of a tackle from Avonte Maddox on the final drive for Los Angeles. He dragged Todd Gurley down before he could make it out of bounds, and it cost the Rams valuable time on the clock. The rookie just keeps coming through. • I suppose Foles wasn't going to be perfect. I'll live with the interception given the rest of the game, especially because it was a pretty good play from Aqib Talib. • Man, does that loss to the Cowboys last week sting even more now. The Eagles would be sitting pretty after Dallas' loss to the Colts on Sunday, instead of relying on other pieces to fall into place to boost their playoff chances. • It was a good day at the office for the offense, but boy was it a brutal showing once the game got tight late. Blocking got sloppy, Foles' throws sailed a little bit, and the Eagles picked up penalties that junked up their attempts to run out the clock. Fortunately, the Rams gifted them the ball back on special teams when things were heading in the wrong direction. It's about time the Eagles were on the receiving end of some luck, honestly, so good for them. • This is one of the only times you'll hear me say this — I thought Pederson should have punted the ball with time winding down. The Rams were out of timeouts and would have had to drive down a long field, and it was certainly not a gimme field goal attempt in the first place. • Jared Goff's performance in the second half of that game was brutal. That dude folded like a cheap tent under the pressure, and the Eagles may have lost that game if he didn't repeatedly throw balls behind his targets.